This complete kit includes our best-selling 48-inch Slideways Slider, Tandem Leg Tripod and Flat Base Tripod Fluid Head. You'll have a professional, heavy duty tripod support for your slider, so you can easily get the smooth and quiet sliding shots you need. 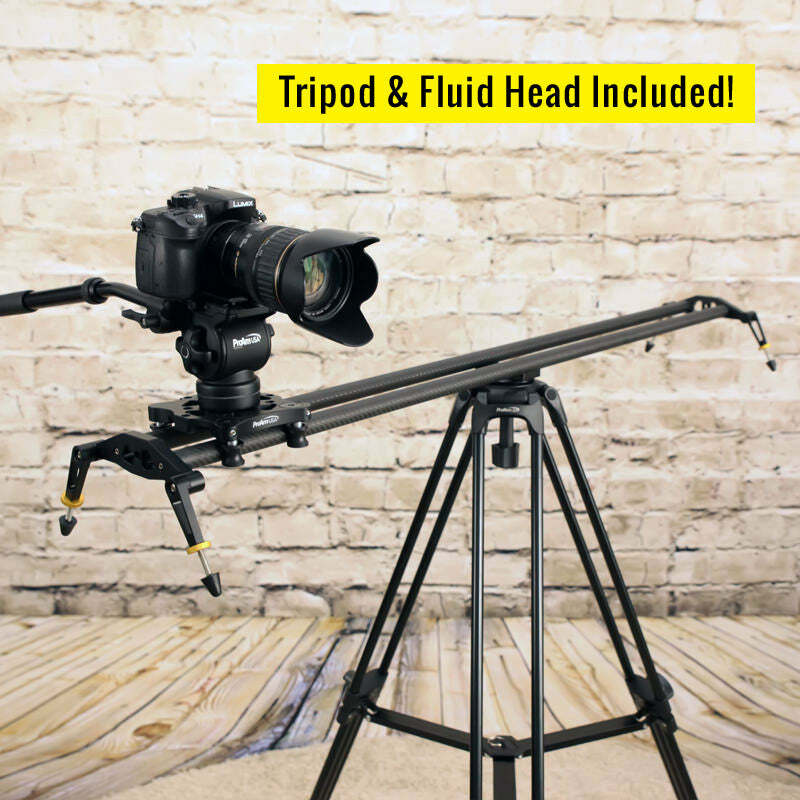 The included Fluid Tripod Head will allow you to get even more dynamic and professional shots than ever before! Smoothly pan and tilt your camera as you move it across the Slideways Camera Slider. Mount your camera and easily track your shots on the durable and lightweight carbon fiber rails. The heavy duty camera platform supports cameras up to 11 lbs and includes integrated bearings for the smoothest of shots! Max Height 58" | Min Height 25.5" | Collapsed Height 27.5"
I have a Sony fs700 with atomos inferno, is this too much weight for this rig? With the Sony FS700 weighing in at 3.25 lbs and the Inferno at 2.4 lbs with battery, you should be well under the limit after your lens choice. The Slideways Slider will support up to 11 pounds. Although, as the weight pushes higher, you might find it helpful to have a second tripod, with one supporting each end of the slider. This will ensure rock solid slides without flexing. Will this slider work for a canon 5d mark iii with a 24-70 lens? And does the slider include the camera mount head? Yes, in fact the video was shot with a 5D Mark II with a 24-70 Tamron lens. The slider platform supports up to 11 pounds. The package does not include the tripod head, but it is available separately here.